The U.S. Mint has released its latest sales report and the 2016 National Park Service Commemorative Silver Proof Dollar has continued to develop momentum for the second straight week. Last week’s total of 1,127 coins sold had been the highest posted for the item since June 1, and the newest figure improves upon that by 155 sales. The new report shows that the N.P.S. silver Proof dollar sold 1,282 units during this period, bringing its overall total to 48,574. This puts the issue on track to overtake sales for last year’s March of Dimes Silver Proof Dollar (56,718), but it has a long way to go if it’s going to match 2015’s U.S. Marshals Service Proof Dollar, which ended up with 107,847 coins sold. As a point of comparison, the 2016 Mark Twain Silver Proof Dollar has sold 68,639 units so far this year. 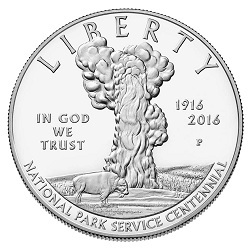 The National Park Service Silver Proof Dollar was the fourth-highest-selling product of the week. The top three slots belonged to the usual high-demand items: the 2016 U.S. Mint Proof Set was first with 9,004 sales, the 2016 U.S. Mint Uncirculated Set posted 5,053 units sold, and the 2016 U.S. Mint Silver Proof Set hit 4,105. Rounding out the top five was the 2016 American $1 Coin and Currency Set, which continued to see notable interest with 1,044 sales. For those waiting to see if the Mint will release any more Mercury Dime Centennial Gold Coins or 2016 American Eagle Platinum Proof Coins, both issues received slight negative corrections this week, with the former’s overall tally becoming decreased by 10 coins and latter’s by 2. The full weekly sales report is included below. The following statistics show total sales for the listed items through July 31, 2016. The first numerical column includes information from the Mint’s July 24 report, the second column displays this week’s updated numbers, and the third column tallies the increase in sales over the last week. Items new to the report are listed in bold. For more information on any of these products, please visit the U.S. Mint’s online product catalog.